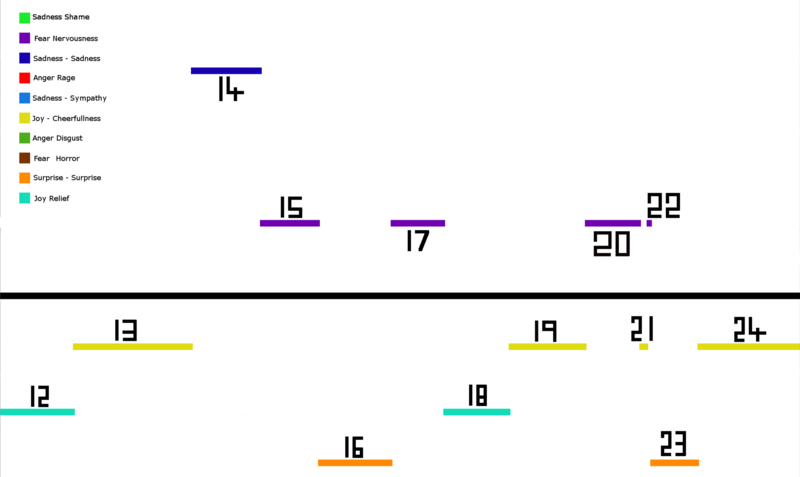 The format of this piece will be a description of Elfen Lied Episode 1 Scene 4 with a to scale time line with emotion sections plotted with the following Key, where High Emotions are plotted below the time line (black line) and Low Emotions are plotted above. Following this there will be a number of pie charts in the following format. Pie charts on the left are Totals of the scene, and pie charts on the right are Screen Time. Lastly the raw data for this scene will be presented in the form of a table. Follow this link to the main entry for this article series. Spoiler Alert! You’ve been warned! The first episode of Elfen Lied is indeed an interesting ride. As viewers we are introduced to a scene of violence and Horror, and though we find a glimmer of Joy, it serves only to fuel the Disgust and Rage we feel towards the one responsible for Kisaragi’s gruesome death. The following scene shifts gear by employing a number of different emotions which creates significant contrast with the previous scene. Relief, Surprise, Sadness, extended periods of Cheerfulness are evoked with such methods as soothing music, nature, natural light, and the introduction to a more ‘normal’ world with ‘normal’ characters. Yet even then we sense sadness behind a veil of normality. We start with torrential rain, and darkness enshrouding (29) Koutas house, a complete contrast to its appearance in the episodes second scene. It is a foreboding transition from the previous scene where Kurama announced that Lucy should be killed, and not captured. The scene shifts to a well lit room with Yuka speaking with some cheer (30), and Nyu looking inquisitively at the contents of Koutas bag. Nyu reaches out, and pulls at a box which falls opens to reveal a pink looking seashell. On seeing the seashell Yuka inquires about it to which Kouta explains that it is indeed a memento of his sister Kanae, and we transition into a ‘Happy‘ memory at the beach (31). Sadly our brief Happiness turns to Sadness as we find out from Kouta that his sister has passed away. Since my time at The University of Edinburgh, one of my interests has been A.I in games. One great resource I came across that is both informative, and accessible is a YouTube Channel called AI and Games. The channel is hosted by Tommy Thompson, an Artificial Intelligence researcher, computer science lecturer, and game developer. The channels videos/lectures, and accompanying articles on their site make useful materials for anyone interested in the field of AI and Games. I’ve personally found these resources to have been most helpful. In particular an informative video that had a look at the A.I. used in the game F.E.A.R helped me write my notes on the A.I. employed by F.E.A.Rs NPCs. If AI and Games is also one of your areas of interest, be sure to give this a channel a look! To kick things off, here’s a video by Tommy Thompson which serves as a good place to start. The format of this piece will be a description of Elfen Lied Episode 1 Scene 3 with a to scale time line with emotion sections plotted with the following Key, where High Emotions are plotted below the time line (black line) and Low Emotions are plotted above. Elfen Lied Episode 1 Scene 3 starts with a mangled ball of steel bathed in blood (25) and dead silence except the sound of dripping blood. It’s a big change from the previous scene, and is a shock into a short section of Horror. We move onto a shot of Kurama, his back stained with a bloody hand print left by Lucy (26), reminding us of her. Perhaps viewers might wonder what kind of relationship do they have? Why didn’t she kill him? Is it a mark of shame? The format of this piece will be a description of Elfen Lied Episode 1 Scene 2 with a to scale time line with emotion sections plotted with the following Key, where High Emotions are plotted below the time line (black line) and Low Emotions are plotted above. Sound – Wind, birds, running water, and the rustle of trees. Music – Light string background music that is sweet yet melancholy. Color – Lots of light, bright colors, and plenty of contrast. Green foliage, blue water, and sky appear a good deal in the first section, as well pink blossom trees and their petals as high lights. The use of these colors help add life to the plain grey concrete. As a small aside, its worth noting the contrast in crafting between the cold, lifeless and deadly silent environment of the the previous scene, and this scene which is full of light and life. One day surfing the web, watching videos on a great Youtube channel called Wisecrack. I came across a video discussing the philosophy of a show called Rick and Morty. Piquing my interest I decided to give the show a chance. Rick and Morty is an adult animated television series created by Justin Roiland and Dan Harmon for Adult Swim, and it hasn’t disappointed. I’m happy I watched Wisecracks video beforehand as it gave me a deeper appreciation for the show, particularly regarding the exploration of Lovecraft’s Cosmic Horror. Adult Swim has renewed Rick and Morty for a third season. Hopefully it will be out sooner than the last gap between seasons. Until then if you live in the US, you might be able to watch episodes at Adult Swim or on TV. Here is a clip from Rick and Morty. One of many fun little nuggets. Give it a watch! The format of this piece will be a description of Elfen Lied Episode 1 Scene 1 with a to scale time line with emotion sections plotted with the following Key, where High Emotions are plotted below the time line (black line) and Low Emotions are plotted above. 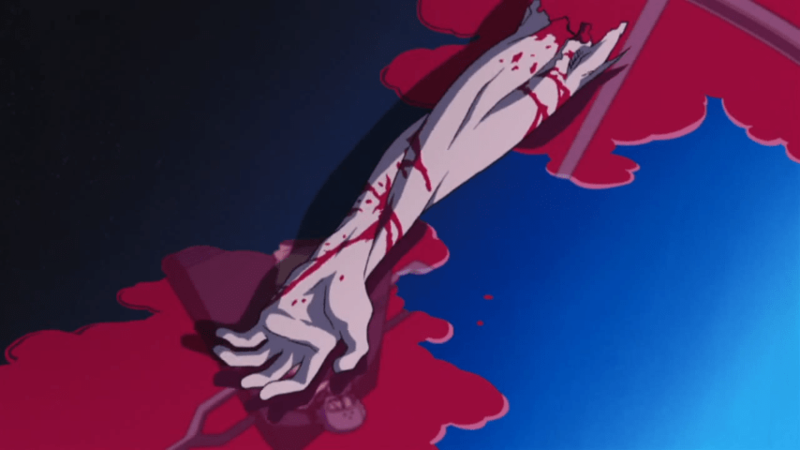 Elfen Lied Episode 1 Scene 1 begins with a severed hand, in a facility which is clean, cold, and deathly silent. We are thrown into a series of grizzly scenes with absolutely no context (1) . This short piece details a brief study on the emotional makeup of the anime Elfen Lied’s first episode. To aid this endeavor I will be employing some lite statistical techniques and scientific methodology. Please note that this is very much a subjective piece, being simply a personal study for the purposes of furthering my own understanding of how this experience was crafted. High = Love, Joy and Surprise. Low = Anger, Sadness, Fear. Lately I’ve been watching Black Lagoon, and during the second half of Episode 7 there’s a great scene where Rock and Revy argue. What transpires is in my opinion a turning point in Rock and Revy’s relationship that is worth a deeper look. Since a hobby of mine is analyzing scenes (though I rarely transcribe my musings), I thought to myself, heck I have a blog and a great scene. Lets write something down. The focus of this short piece will be on my major observations of the imagery employed by the creators of this scene. Why imagery over dialogue? Simple. Because I’ve found gleaning meaning from the imagery of this scene more enjoyable (a big props to the English dub by Brad Swaile & Maryke Hendrikse, their amazing work makes this one of the best anime scenes that I’ve had the pleasure of experiencing). If there is no Robin Hood why don’t you become Robin Hood! – Rock, Black Lagoon. This anime has been worth my time, and here are some reasons why it might be worth yours too. Black Lagoons characters are complex, none being plain Black or White. Considering Rock, one of shows main protagonists, not only does he serve function as a gateway into the world of Black Lagoon, he is designed so that our impressions of him to change over time as he evolves throughout the series. Rock is not alone, he’s accompanied by a fascinating cast of characters, and relationships between them (namely between Rock and Revy). Great use of imagery, particularly the use of shadows, their masterful use of facial expressions which can be particularly seen with their Omake episodes, and Roanapur as the land of the dead? A fantastic job with the English dub. A rich story lines giving you plenty to think about, namely the Vampire Twins story arc. If you enjoy food for thought mixed with action, drama and dark comedy in a realistic setting, you should definitely give this a watch. Check out its page on Wikipedia and its own Wiki for extra information. Here’s a trailer to wet your appetite.